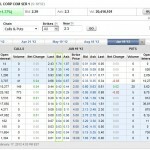 The first “in the money” option is $2.00 – Expiration Jan 19th, 2013 for a premium of $.64 (27.82% of stock’s current value. Why in the world would I take the GE’s 4.77% if the Sprint is paying 14.78% for the same timeframe? Because the market is currently displaying more risk and doubt of the valuation, via the option chains. Think about it this, the stock market is willing to pay you more to buy and then “rent” the Sprint stock than the “GE” stock. How can it possibly be 14.78% in 11 months?! Sprint is a stock that is on the radar for most analysts to make a recovery or go flat out bankrupt. Because the market views Sprint as a more volatile stock, there is more potential upswing and downswing to this stock. It’s more of a gamble and has more risk, therefore your return needs to be greater. The market thinks this stock’s price is very likely to change and people are willing to pay more to speculate that it is going up. Does this option chain mean Sprint stock is going to go up for sure? No, but it does mean people are speculating that it will go up. They are willing to pay more of a premium for the chance of capturing that giant upswing. Stock A costs $10 and the market believes it can go up or down $5 this year with a 50/50 chance of either. Stock B costs $10 and the market believes it will go up or down $1 this year with a 50/50 chance of either. If I wanted to buy an option with a strike price of $10 of Stock A, would it cost more than an option with a strike price of $10 for Stock B? Yes, because there is more gain and more loss to be had with Stock A – it is more volatile. I don’t want to potentially lose $5 by owning the stock and it going down, but I do want to capture that $5 upswing. 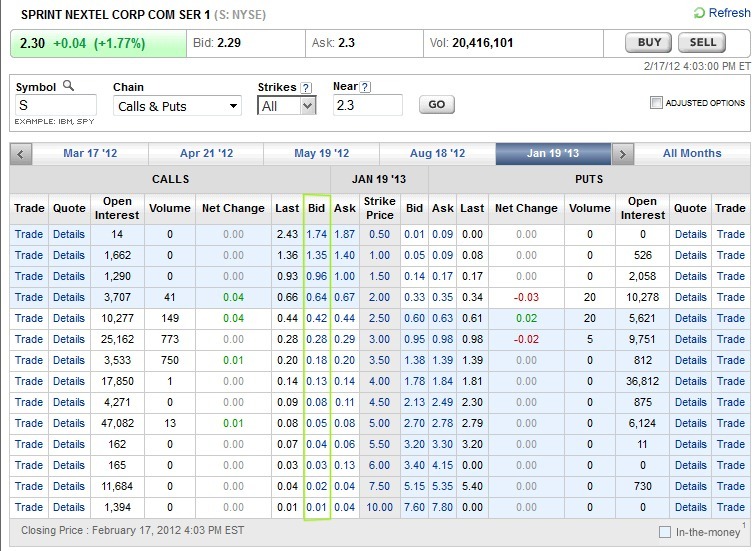 If someone offered you an option of Stock A for $1 – it would be a good investment because it is a estimated value of $2.50 minus time value of money (50% chance of +$5), but if they offered you an option of Stock B for $1 – it would literally be a gamble of $1 on a projected 50/50 chance of gaining or losing a dollar of value. Take home message: Option chains represent how much risk and potential return a stock is perceived to have in the market, which can provide insight for the potential projects of a value of a stock. If a stock option produces an effective rate of 2% for the stock option issuer, the stock is most likely viewed as valued properly and has very little perceived downside or upside and conversely if the stock option produces a large gain the stock might be on the verge of a breakout (negative or positive). Of course these value chains will not produce an actual dollar value, but they will give you an idea of how volatile the price of the stock is perceived to be in the market. More to come on options. Disclaimer: Consult a professional for any investment advice. This blog is for entertainment and educational purposes only and should not be used for any decision making, ever.